We’re proud to announce that as of this month, we are an official member of Join.Me’s new integration partner program. 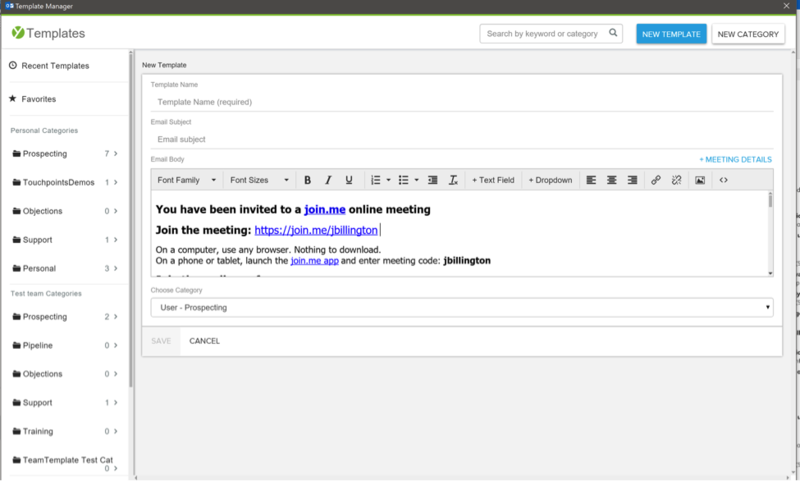 🙌 Sending meeting and demo invites just became quicker and even easier. You can now access your Join.Me account right from your inbox. We’ll save your meeting details as a template for you to one-click insert into your outgoing invites. When you create a meeting, click the templates button in the upper lefthand corner. Then, choose “New Template” to bring yourself to the screen below. 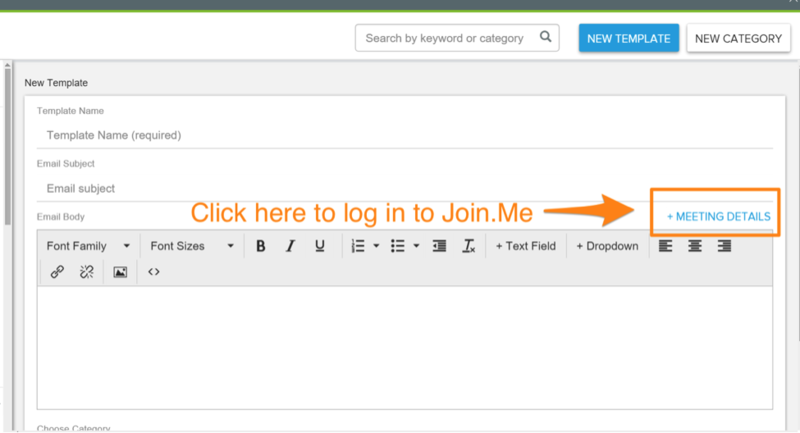 Once you click “+ Meeting Details,” you’ll be brought to Join.me’s site to log in. Just confirm your login details, and voila! From there, you can insert your meeting details without having to type out a single word, while having the ability to customize if you’d like to. You can also create multiple meeting templates with your Join.Me info (especially useful if you want to separate out meeting info for calls vs. video conferences or tailor dial-in info for a specific state or country). Note: This integration works for current trial and paid Join.me users only. We walk them step-by-step through features like email tracking, Send Later, Templates, Reminders, and Mail Merge. If you haven’t used one of these features, give it a try! 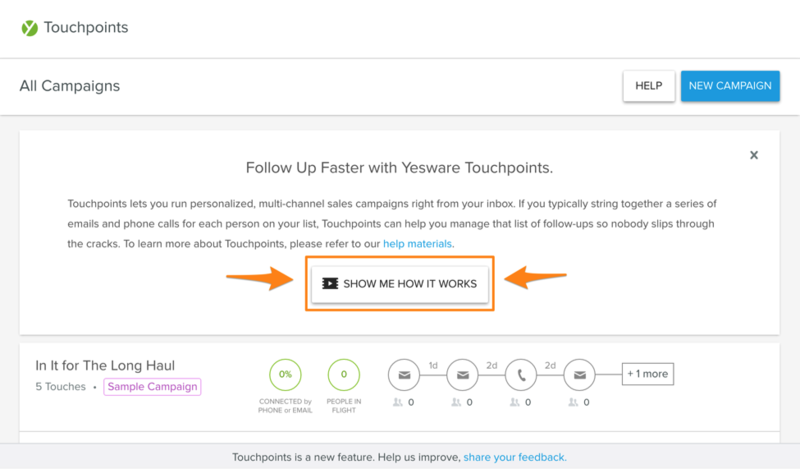 All Yesware Enterprise users on Gmail now have access to Touchpoints, our new super-easy campaign manager for Salesforce users. If you missed our initial announcement, read the whole story we published last month here. Once you see Yesware in your inbox (like the below view) you visit this how-to post for some helpful tips. Note: our engineering team is hard at work building Touchpoints for Outlook (along with other features). Stay tuned! Improved compatibility of Yesware for Gmail and LinkedIn Sales Navigator so that users can use both extensions without problems. Changed the Salesforce sidebar error message that said “Yesware is Offline” to “You are Offline” to reflect that user is not connected to internet. Added a logout button for users who complete trial and don’t upgrade and for those Outlook users who regularly switch between multiple accounts. Lapsed users can dismiss “Upgrade Now” pop-up.